The Newitts 6.1m Club Badminton Net is a good quality net for use at club level. Nylon net made from regulation 19mm mesh. Club quality - 6.1m (20ft). Securing cords at the bottom and top of the net. The club have needed one for a long time, old one was full of holes and too short. New one is brilliant, correct length and ties well. Not sure it’s improved our game though ?? Excellent quality, light and strong , well made, with very robust tie cords. Excellent service - fast and friendly, kindly changing delivery address on request. Would highly recommend. Has already brought hours of fun. Light enough to tie to any fence, (for example), allowing adjustable height for smaller children. Excellent product - just what the club wanted and at a very good price. Delivery came on time. Thank you. I had searched many sites for a suitable net having had to return one not up to the standard required. Purchased two due to the good reviews and glad I did, the are perfect for our clubs needs at a very reasonable price, would highly recommend. The nets were perfect for our requirements and I would recommend them. The price was reasonable and despatch was prompt, with good communication. We have recently purchased 4 Ziland nets and found them to be good quality at a very reasonable price. The only negative comment I could make is that the various cords are too long and all needed to be trimmed. With a bit more thought modifying the length of the cords could save you some costs. Good quality nets at reasonable cost.Would recommend for club play.The nets were delivered on time with no problems at all. I wrote a review and was told it had to be 20 words long which it wasn't. So I left this box blank. That wouldn't do either. Here is my review:- 'Very good product. Strong and durable construction and straightforward to erect.' I hope this will do. Good quality net at a low price. A light weight product ensuring a taut net when used with club weight posts. Good price, good quality and delivered on time. No complaints. No doubts. I recommend the product and the company without reservation. Supplied net to my customer with a set of post . Really happy with product. Many Thanks would buy again soon. We have been delighted with the quality of the net. I'm sure it will do many years service. Many thanks. The quality and price are beyond my expectation. 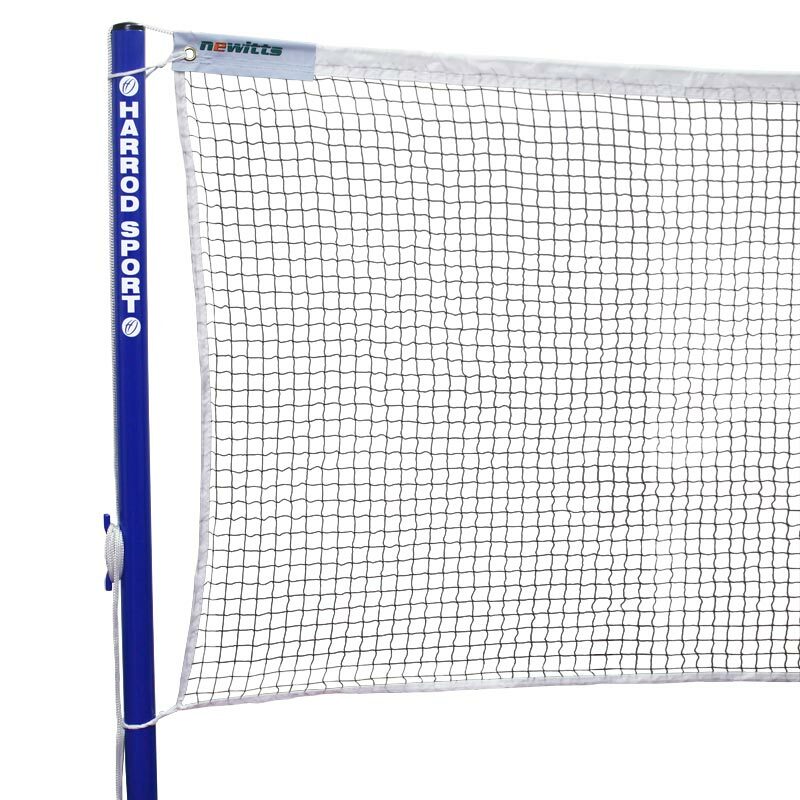 This net fits the poles (usually in blue) used in schools. In addition the lightweight of the net maintains quite horizontal across. Quality was great! It is light enough so that it can be tied on to poles with a figure of eight and the net stays very horizontal all the way across. I bought one of these and a JPL, and found they were of the same quality, so bought the two more Newitts nets as they were cheaper. These are the best nets I have ever bought for our club. Excellent quality and above all, the correct size for our courts which are 20 feet.